Franklin is a major supplier of tents to the British Ministry of Defence, primarily the ITC shelter system and has been closely involved in the development and improvement of the system to meet evolving operational requirements. Franklin is a also a major supplier of field hospitals, temporary shelters, modular container shelters, tents for humanitarian aid and CBRN shelters. This is the mainstay of the British Army's deployable tentage. Designed to be easily erected, versatile and modular, it provides shelter and protection for accommodation and field hospitals in support of today's expeditionary force philosophy. 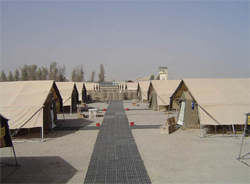 Camps to house 125, 250 or 500 men are modular in construction and use a formulated layout designed to route all the necessary essential services, provide partitioned area protection and yet combine ease of movement within the camp and secure access. The main module of the ITC is the 24x18ft shelter unit, usually deployed in 24, 48 or 72ft long configurations. This combines with the 12x12ft shelter unit, the porchway, passageway and four way connector, to make the five essential components of any camp. The addition of insulated liners and sunshields make air conditioning much more effective to provide additional levels of comfort in inhospitable climates and under harsh operational conditions. As well as our standard products, we also make a range of specialist shelters, annexes and attachments to meet specific requirements. Our production department can help design custom products to fit specific vehicles or modular container shelters. Design modifications can include larger or smaller windows, roof apertures for antenna or reinforced with flame retardant materials for chimneys. Shelter end panels are designed to attach to a range of specific vehicles and can incorporate blackout connections, environmental protection or CBRN facilities. Click here to see more about our tents and shelters. Turnkey packages incorporate all the necessary components for a complete camp in modular sizes suitable for 50 men or 500. Our experienced logistic staff will ensure that all equipment is compatible and meets local environmental and operational requirements from the ground up. As well as shelters for accommodation, dining, cooking and ablutions, and camp furniture, we can include ground stabilisation preparation, paving and walkways, traditional or 'green' power generation equipment, HVAC, fresh and waste water facilities and storage, fuel storage as well as incorporating our DefenCell perimeter protection, compartmentalisation and ECP force protection. 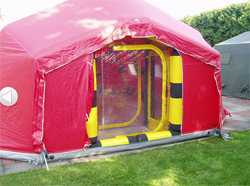 Shelters for protection against chemical and biological threats are available in a range of sizes and designs for multiple protective applications. Using sophisticated materials and construction techniques, we manufacture and supply shelters to protect troops or staff from external threats or to isolate contaminated personnel. Shelters can be fitted with showers for decontamination, with options for multiple lanes for personnel or stretcher borne. Click here to see the Personal CBRN protection equipment on Franklin Equipment website. All the products are made to the highest standards to meet NATO standardised requirements and, working closely with various MoDs, we have designed and incorporated several improvements in the equipment to increase comfort, extend durability and meet the varied requirements of modern expeditionary environment. Click here to see the full range of camp equipment. Franklin manufactures camouflage nets and concealment sets for woodland, desert and snow conditions, for protection against detection in the visible, thermal and radar wavebands. Click here for more information about Camouflage Nets. Franklin have a regular contract to supply the MOD with a range of full-size inflatable decoy targets for training. The inflatables offer realistic visual, radar and thermal image signatures and are rapidly deployed in less than 15 minutes. Models include Scud missile and launcher, T72 tanks and SA15/19 vehicles as well as other styles created specially to meet new training requirements against evolving threats.